I had seen Ruth Weill’s name a lot in Riverwest communications and she had seen mine, but somehow we never met. She’s been on the board of the Riverwest Neighborhood Association and has coordinated Center Street Daze for the past three years, but it wasn’t until I put my notebook away that Ruth’s passion came out – politics. She’s bright and informed and in touch with what’s going on not only in the city, but the nation. A Green Party member forever.Ruth’s worry is that after the enthusiasm of the lastpresidential campaign, we’re not “really paying attention” at a time when everyvote counts. I can see her running for office soon. She’s got the energy andthe personality to get and keep people engaged. Ruth has the political sense to understand business is keyto community. “One of my goals is to help businesses organize because there ispower in numbers. . . I’d like to see a real business association inRiverwest.” Working on Center Street, Ruth would also like to see the areaimproved with nature-scaping and maybe a corps of Riverwest ambassadors likethe downtown area has, who would walk around welcoming people and answeringquestions. 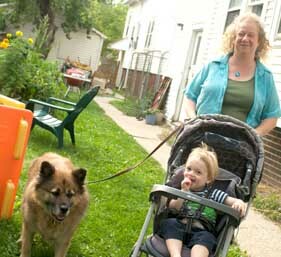 Having grown up in the suburbs, Ruth appreciates the senseof community in Riverwest. “It’s like a small town within a big city.” Ifyou’re involved, like Ruth is, you get to know people easily, but you have easyaccess to the entertainment and culture centers of downtown and the lake front. Being involved and running a restaurant, Ruth knows lots ofpeople and lots of dogs. “I like that it’s dog friendly. We have a dog bowl forwater outside the restaurant. So do other places.” You may run into Ruthwalking her dogs, while pushing Brad in the stroller. Stop and talk. You’ll find it won’t take any effort at all to start a conversation.